No, that's not Georja and Gerald dressed for a costume ball. 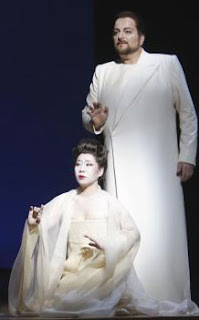 It's soprano Liping Zhang and tenor Franco Farina singing their hearts out in LA Opera's current production of Puccini's Madama Butterfly. We took some playful swings at Robert Wilson's austere staging in our review for LA Splash but ended up following the Hyper Critics oath and ultimately did no harm. Click here to read what we said about our experience on opening night. And lest you think this is far afield from boychik lit, go see it and then tell me its not all about sexual politics (albeit in 1904). Navy Lt. Benjamin Franklin Pinkerton sings in Act I (very loose translation from the Italian), "We Americans go all over the globe, screw the locals, take our profit, and never mind the risk. In fact, wherever there's a risk, that's where we drop anchor."